Learn more about the Lorex 4 Megapixel HD IP Security Camera with Color Night Vision. Get pricing, and answers to common questions. The Lorex 4 Megapixel HD IP Security Camera with Color Night Vision features a 4 megapixel image sensor that enables it to record double the resolution of 1080p. This Lorex security camera provides improved night-time security coverage because of its Color Night Vision (CNV) feature. 90° FOV for monitoring wide, open areas. Pros: High-quality video for seeing fine details. Outstanding distance vision. Cons: Not that easy to set up at times. Bottomline: Security camera with 90° wide-angle lens that can cover large areas such as warehouses and yards. What are some alternatives to the Lorex 4 Megapixel HD IP Security Camera with Color Night Vision? Where can I buy the Lorex 4 Megapixel HD IP Security Camera with Color Night Vision? The Lorex 4 Megapixel HD IP Security Camera with Color Night Vision is available via Amazon and the Lorex website. Does the Lorex 4 Megapixel HD IP Security Camera with Color Night Vision work at night? Yes. Its Color Night Vision (CNV) feature provides full-color video, even in low-light, and can identify people or objects up to 150 ft. This camera's ClearNight technology provides black and white low-light viewing if it is too dark for color imaging. It uses DNR (Digital Noise Reduction) technology to filter out noise from low-light settings, as well as noise caused by motion. Can the Lorex 4 Megapixel HD IP Security Camera with Color Night Vision be used in any weather? Yes. 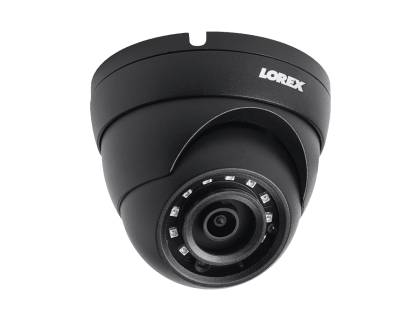 The Lorex 4 Megapixel HD IP Security Camera with Color Night Vision is weatherproof. This IP66-rated camera is perfect for the outdoors and can comfortably withstand inclement weather. It can operate in temperatures between -22 °F and 140 °F. Sometimes it can continue recording in much lower temperatures.